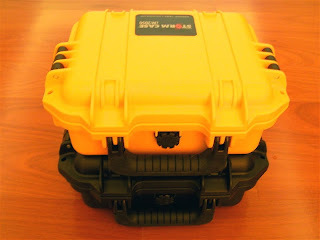 I finally gave in an got another Hardigg Storm Case. This time I got the yellow version. I wanted to get the orange one as well but evidently, they only have black and yellow. I have to say that the case is just awesome. It give great all round protection. 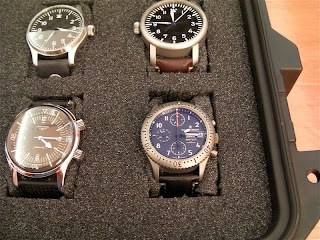 Before I forget, I did fill up the one empty slot in the black case with the Revue Thommen Airspeed Chronograph Classic Titanium. 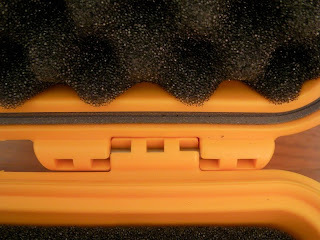 The model number for the yellow case is iM2050-20001, which means it is yellow case with black handle, latch, button and Vortex Valve and comes with the Multilayer Cubed Foam. I forgot to state in the review of the black case that the case is water tight and dust proof. Also the hinge is very robust. You can see this in the photograph below. You can see the grey seal in the lid. 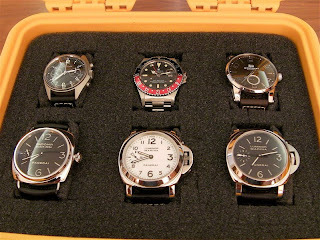 Anyway, the watches that are in the case, well protected by the foam and robust HPX resin are, from the top, Precista PRS-5 Chronograph, Rolex GMT Master (1675), MontBlanc Timewalker Big Date and on the second row, Panerai BlackSeal PAM00183, Panerai Luminor Marina PAM00003 and PAM00111. That is just awesome, three 44 mm watches side by side. 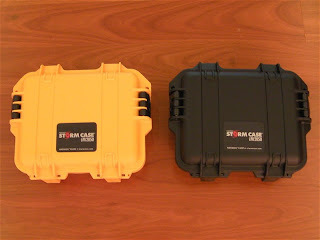 The other reason I like the Storm Case is that it is stackable, a real space saver. I am just loving it.